OK, here is my version of that Batman menu. Thanks to whoever made it in the first place, as well as some artistic posing pictures, from browsing internet. As the original menu and theme still work in Windows 7, I guess this skin is a port for Windows 8/10. 1.Make sure to set to Windows 7 style. 2.Make sure to turn off the menu shadow in CSM settings, in "Menu look" tab. This will get rid of the vertical right line beside the menu. I used combination of cropped screenshots, as well as some, from searching in the msstyles file. As I figured, the top would be a problem with the shrinking, and stretching. I did what I could. Don't expect perfection. For me, I left the "Programs pane width", and "Jumplist pane width" on default settings. On my default setup, the top part is more or less symmetrical. It could go way out of proportion/distortion. Hope it's stable for most people. Can't work how to make all programs button stay on. Did not know how to put texture on the search box, so at this point, it only has at its' ends. The original Batman picture is only half a body that stretched from bottom of menu. Did not look right. So got picture from net, and pasted on very dark legs. There are a few visual glitches here and there, that dumbfound me. Oh well, life's an itch. I included option to not show pictures on menu. If you like the skin, but dislike the Batman logo, I included the main/search, and jump bitmaps in a folder. I removed the pictures, and top Bat logo. Personalize away. Put your own picture on there. EDIT: I modified the jumplist bitmap to make top logo oval, the same size. Last edited by juniper7 on Mon Dec 28, 2015 6:32 pm, edited 1 time in total. I am not a fan of hero of movie or BD, but it is necessary to admit that that is classy! THANK YOU SO MUCH!!!!!! Looks great! Here's what I've got my computer looking like so far with your start menu and some rainmeter add ons. I love the start menu look. You did an awesome job juniper7. Better yet, playing around with it. I think I enjoy the blue bat without pic even better. Again, you did an amazing job with every bit of this. That's a pretty neat bat in the center of desktop. So many types of texture. with the overspray landing on the desktop. I can't take credit for the menu. Only the time copying it over, with a few changes. That picture of Batman in the menu, became a laugh when I put him inside. He ended up with skinny little forearms. I had to draw some lines on his cuff shields, to make better. I even had to fill in the hole on side of his head, due to poor quality overexposed download. Noticed afterward the alternate split button has different transparency. Was going to fix it, then decided, let it be. This is the same BatDude skin, along with three characters from the new XCOM2 game. Thanks to mykou, for incentive from his great skins. Edit: Flipped search picture for better visibility. Last edited by juniper7 on Mon Dec 28, 2015 8:17 pm, edited 2 times in total. Keep the great work ! 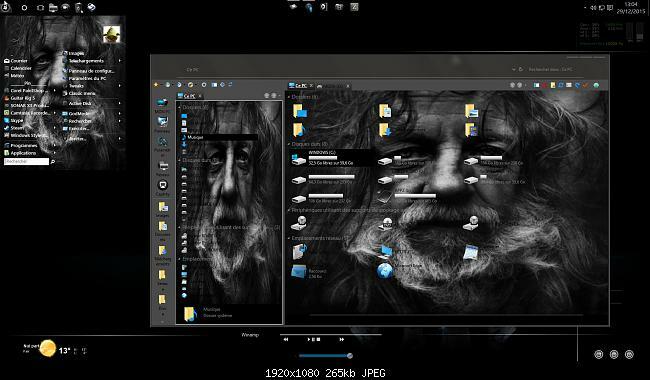 It is far better than the so-called master skins which I have purchased from stardock, and just can not endure the poor performance and ugly metro icons of Start10. Was ported into CSM skin, with added pictures from internet.